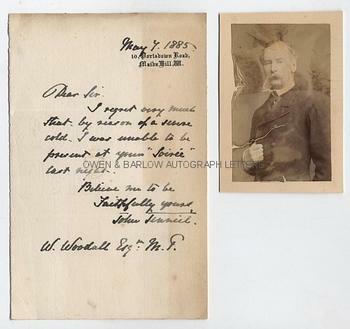 SIR JOHN TENNIEL Autograph LETTER Signed. English illustrator and graphic humourist. Best known as the original illustrator of Alice's Adventures in Wonderland by LEWIS CARROLL and as a long-serving Punch cartoonist. ALS. 1p. 10 Portsdown Road, Maida Hill, W. May 7th 1885. To William Woodall M.P. Together with a contemporary portrait photograph. "I regret very much that by reason of a severe cold, I was unable to be present at your soiree last night." 12mo. Approx 7 x 4.5 inches. 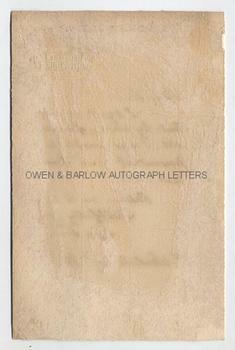 Some browning and off-setting from its previous mounting in an album and with mounting traces on verso. Good. The photograph is an albumen silver print measuring approx 3.5 x 2.5 inches, laid down on part of original card album leaf, with some creasing and edge tearing caused when originally mounted.